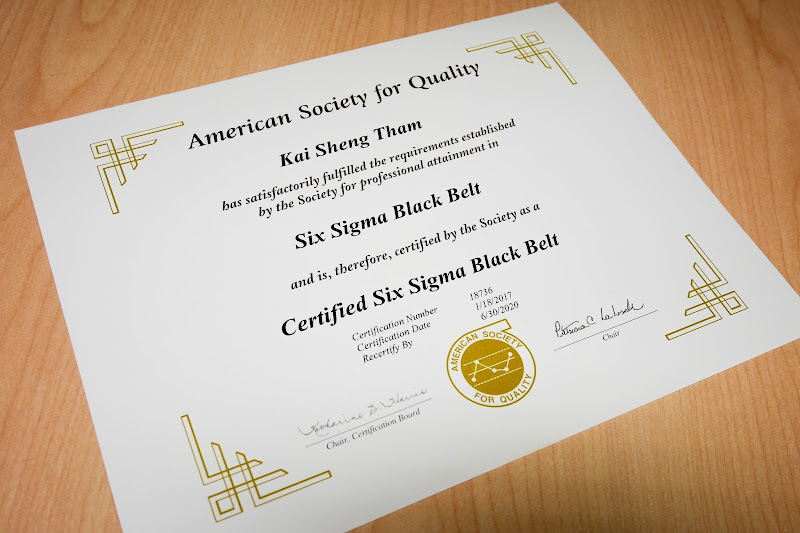 I started taking the ASQ Six Sigma certifications in March 2016, to be specific, I took Certified Six Sigma Yellow Belt (CSSYB) in March 2016 and Certified Six Sigma Green Belt (CSSGB) in June 2016. Unlike Yellow Black and Green Belt, a Certified Six Sigma Black Belt candidate is required to have two completed projects with signed affidavits or one completed project with signed affidavit and 3 years of work experience in one or more areas of the Six Sigma Body of Knowledge. I already have more than 3 years of work experience in Cameron and so I used one of my Six Sigma Green Belt projects (Warehouse Picking Cycle Time Reduction) in Cameron as my affidavit, signed by the Operations Manager, who was my project champion. I was still a member of ASQ, so I enjoyed the discounted exam fee at US$388 (S$570). My last day in Cameron was 6 Jan 2017 and I'm joining Seagate as a Lean Engineer, and so I requested to join Seagate on 19 Jan 2017, which is a day after my CSSBB exam, so strategically I have time to study at ease during the period I was jobless. ASQ has recently phased in computer-based testing, so similar to PMP and PMI-ACP, the CSSBB exam is delivered by Prometric testing centers, and again, Kenneth and I booked our slots at the King's Arcade branch. You'll know your results immediately after submitting the answers. No more pencil marking and erasing. Unlike pencil-based testing, all materials accompanied (it's open-book exam for CSSBB) into the examination room are strictly inspected by the proctor. To sum it up, make sure your materials are binded, not stapled; and no sample Q&A portion can be taken in - they flip through almost every page to check on that. When it comes to reviewing each question, you have to click one by one as one question is displayed in one screen, so you can't take an quick overview of a section. I had my first job landed in Cameron as a Global Rotational Development Program trainee, ever since then, I was exposed to the Six Sigma methodology because Cameron was a Lean Six Sigma enterprise. I'm thankful that I was given the opportunity to lead the warehouse project which also served as my very first Lean Six Sigma Green Belt project. This first step was important in keeping me motivated further to subsequent Green Belt projects, which in time I closed a total of 3 Green Belt projects, entitling me to be certified as a Cameron certified Six Sigma Green Belt. I believe it's the success and job satisfaction derived from project results and deliverables that made me persevere in the Lean Six Sigma discipline, to the point that I wanted to take ASQ Six Sigma certifications and considered this field for my future career. How did I prepare for CSSBB? You probably don't want to follow my footstep for this, because I only seriously started to study 2-3 weeks before the exam. Do a search online for tips, they'll tell you to start preparing at least a few months before hand. The reason why I did last minute preparation is because I was busy (actually, lazy... XD). Also, I have read one of the modules in my Master of Science program in NUS last year, titled Applied Engineering Statistics, which comprises of the essential topics in inferential statistics. This saved me a lot of time going through topics in hypothesis testing, ANOVA, regression, DOE etc. I used the CSSBB Primer (2014 Edition) I already had there available from someone else. I personally have not gone through the handbook so I can't judge which book prepares the candidate better. But what I can say is, the real exam questions are pretty similar to the CSSBB Primer Solutions Text. It's a 165-question, 4.5-hour-long exam, where 15 of them are unscored. I finished and submitted my answer in 3 hours because I just don't feel like wait any longer. It's pretty draining as well for 165 questions, but I told myself that I had worse from PMP, which was 200-question. As mentioned, the results will show on the screen after the answers are submitted, and thank God, I passed. I do feel contented with the certifications I've achieved so far, CSSYB, CSSGB, CSSBB, PMP and PMI-ACP, all done within 10 months on first try, while I was still studying for my master's degree. Grateful. I read your blogs on how you attained your CQIA and CSSGB and I must say that you inspire me greatly. Congratulations! I am interested in pursuing a career in Process improvement therefore I am planning on sitting for the CSSYB in Novemeber this year. In your blog, you provided books you used for preparations like the Primer by the Quality Council of Indiana. I intend purchasing the CSSYB Primer 2014 edition. Please do you think it would be enough for me to learn and prepare for the ASQ CSSYB certification exam? Also, what advice would you give a green-horn like me who is trying to start a career in the field of Quality/Process Improvemnet? CSSYB Primer should sufficiently prepare you well for the ASQ CSSYB exam. If you are very new to statistics, do make sure that you understand those statistical topics in the primer. Process improvement tools are easier to grasp as they more subjective and linked to common sense. I would say kicking off your journey with six sigma is a good start to get you into knowing what is expected out of the process improvement field. Try your best in attaining at least a Six Sigma Green Belt certification, and with sounding work experience, they should look good on you with your career path. I passed my CSSYB exam, thank you for your advice and motivation. I will keep reading your blogs over again to be more inspired as I hope to later on prepare for CSSGB and/or PMI-PMP. Congratulations on your Masters degree and good luck in all your endeavours. Congratulations on passing your CSSYB exam! 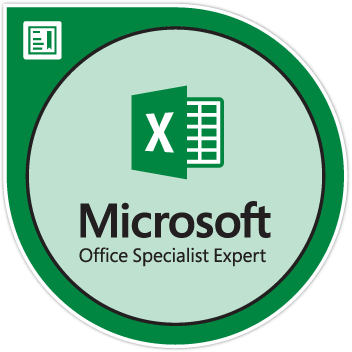 It's great to hear that you are inspired and motivated to attain challenging and rewarding certifications. I wish you success in all your future endeavors. Can one give CSSGB without work experience? I am a Masters candidate with an internship experience . The CSSGB certification from ASQ requires three years of work experience in one or more areas of the Six Sigma Green Belt Body of Knowledge.